So here I am, being welcomed with open arms into the world of Blogging, confused already by complicated sounding IT terms like domains, dashboards, and URLs. I can’t help but wonder what URL even stands for. Upright Row Lunge? And isn’t a dashboard the thing in my car that always needs cleaning but never gets it? Nevertheless, onward and upward I am moving in this fast paced internet highway to allow all those who are interested a keen insight into my ideas, opinions and adventures in the world of healthy living and exercise. So who am I, and what do I do, and why would anyone want to even read this? First of all I’m Jmac, aka Fitmidget. An outstanding physical specimen, a primed athlete always ready for action, lover of all animals hater of no one. A daring fearless adventurer and downright legend in her own lunchbox….. or so I’d like to think. Outside the hypothetical lunchbox that is my own mind, I am really just a fairly ordinary person, a fitness enthusiast who likes to enjoy the finer things in life, but who still can’t swim and definitely cannot reverse parallel park. Which leads me to the next question…what do I actually do? I am a personal trainer, fitness instructor and gym manager, as well as a regular fitness event participant. And while being on this topic I just have to share one of my most favourite pictures that always comes to mind whenever someone asks me what I actually do. Interestingly enough, and although I hate to admit it. I probably do do 5 out of the 6 things listed on this picture (excluding top right hand image). Some more than others depending on the person or people I am dealing with. 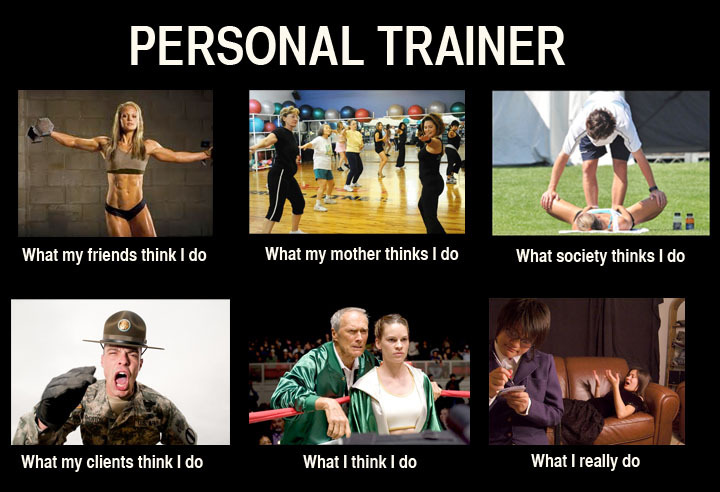 The truth is a ‘Personal Trainer’ is exactly that… personal. Each and every one of us is different hence why I find the world of personal training so interesting. Like fingerprints no one is ever the same which requires us to employ so many different skills in our jobs regardless of how we are often pigeonholed. Therefore I’d like to take a moment (cue the music) to personally congratulate all fellow trainers out there who can admit to being superficial enough to want to keep their bodies as in shape as they can, who do use their role to keep older clients moving and shaking wearing their lycra and fluffy headbands with gay abandon, those who can channel their inner army sargent .. seargeant.. (spelling?) and not only coach their clients but teach them discipline and perseverance and who also patiently listen to the personal issues some clients instill on them. For if you are a trainer who utilises all these skills, then I believe you truly are a person of many talents. Now say it with me, Hallelujah! So moving on from that quaint moment of reflection there, that about covers the who and what, but not the why. Why? Basically after writing a few event reviews, personal articles and manuals on fitness and training someone suggested I should put my expressive writing skills to better use and start a blog. Silly them, teach the waffler how to waffle and post for all to read. Well that’s it! Make mention of food and I am hooked…. waffles are my favourite!! So next week I am being sent off to a social media seminar to learn what URL really stands for, and how to use a dashboard properly instead of clogging this thing up with incessant gibberish. Hopefully I wont embarrass myself too much amongst the business execs and marketing moguls. Thanks DC, I’m still reeling from suprise that I actually managed to set it all up in one day…. ha ha look out blogosphere… muhahahaha! And I definitely think you could do with some more drill sergeant action, it’s quite theraputic too. Fantastic work Jamie! More hidden talents coming to the fore! Interested in reading more from you! Thanks Marman. Mustve got it from my mum.